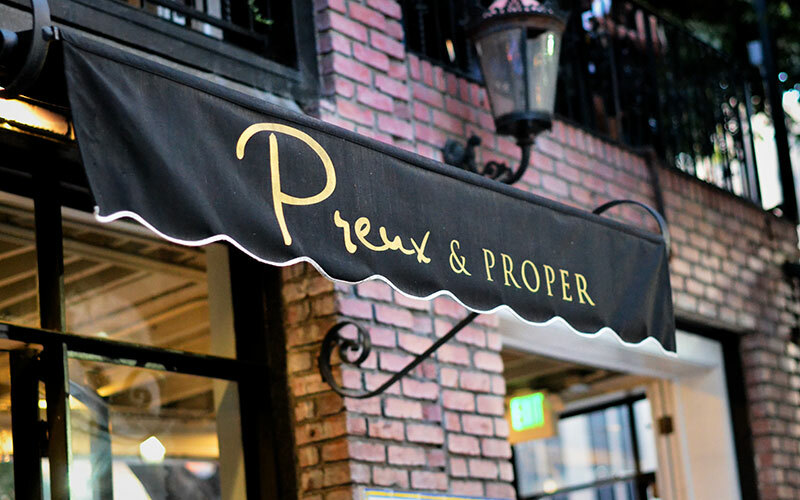 On a quaint little corner of Downtown Los Angeles, Preux & Proper offers the city a New Orleans-inspired menu filled with classics you know and curveballs you don’t. For example, we’ve all heard of gumbo and beignets, but we have probably not all heard of deep dish biscuit dough pizza. That’s not a typo. 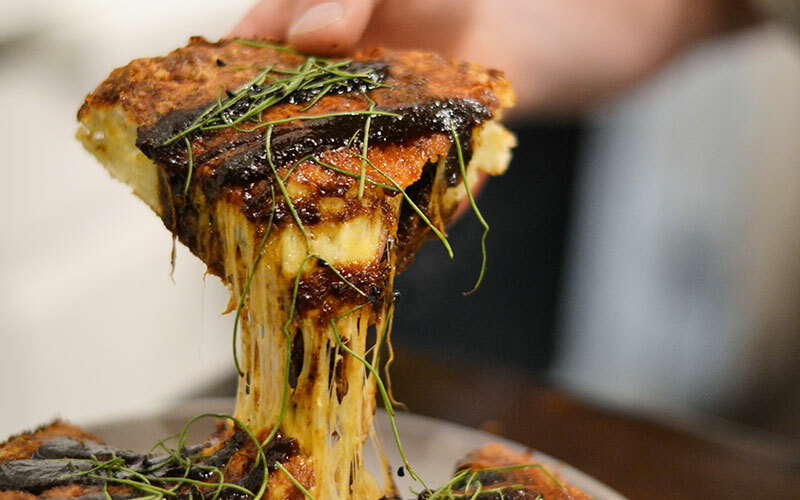 Deep dish biscuit dough pizza is a thing you can eat in Los Angeles. Just to back up, Preux & Proper isn’t new. The red brick restaurant opened in 2014, bringing LA a taste of the French Quarter with twinkling lanterns and wrought iron fencing. The concept is rooted in Creole and Cajun cuisine with a nod to the freewheeling fusion food that’s become a hallmark of Southern California. This theme comes through strong with the aforementioned deep dish biscuit dough pizza. When the pizza first hit the table, the aroma was pretty intoxicating. People from other tables craned their necks to see what we had ordered. 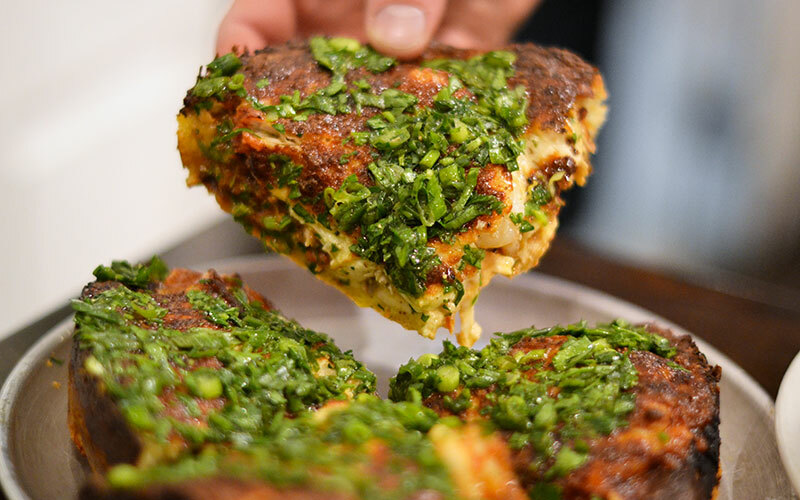 If nothing else, deep dish biscuit dough pizza will draw jealous stares. We started with a restaurant favorite, the Cajun Vacation. It’s made up of house tasso ham, drunken goat cheese, and charred pineapple relish. Initial thoughts focused on the insanity of the cheese overload going on. There’s an ungodly amount of cheese going into each of these bad boys, and it remained mind-blowing throughout the meal. The Cajun Vacation felt like more of a ham and cheese vacation, with hunks of salty pork really dominating the overall flavor profile. This one’s a mix of wild white American shrimp, pulled chicken, smoked mozzarella, persillade, and jambalaya tomatoes. It’s one of the saucier, creamier pizzas we’ve had, and the fat juicy shrimp are way bigger than the word “wild” suggests. The Smoke Box Killa was probably the best of the bunch. Smoked pork shoulder, cheddar, red onion, and something called Paulie’s pomegranate-habanero bbq all went together well. This pie had heat and a nice sweetness from the pomegranate-habanero situation. After taking down slices of each, I started to slip into dangerous carb-and-cheese-coma territory. 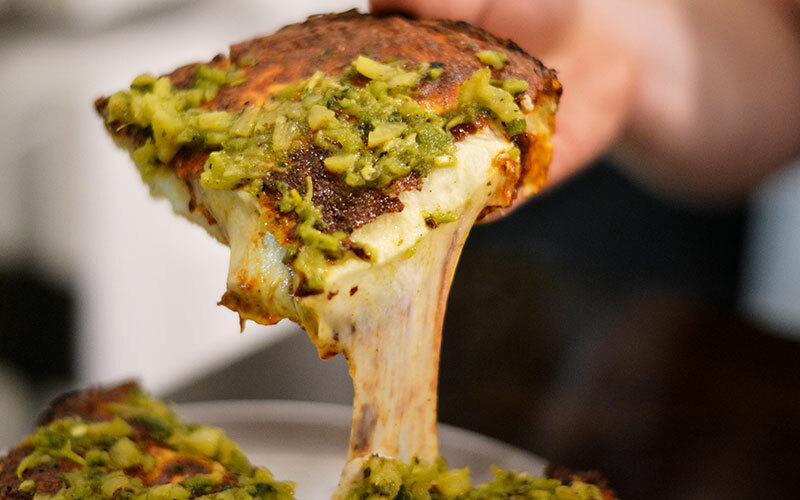 These deep dish biscuit dough pizzas are not meant to be feasted on exclusively, so please, for the love of God, don’t order only deep dish biscuit dough pizzas if you go to Preux & Proper. You’re going to need the help of alcohol to ease your way through the cheesepocalypse. A lot of the biscuit dough pizzas have a bit of a kick to them, so you’re probably going to want to steer away from the Jazz Men with serrano-infused tequila, jasmine liqueur, agave, cilantro, and lime unless you finish it before you get to the heaving masses of cheese and shrimp. 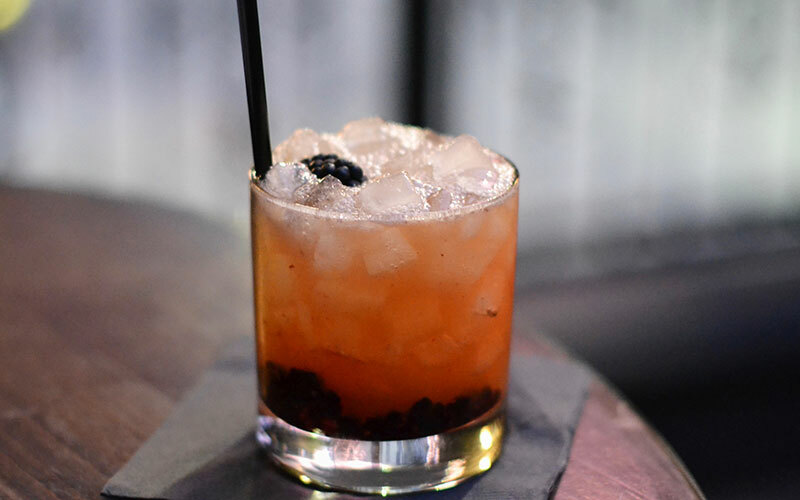 A better pick is the Blackberry Honey Sour with bourbon, wild flower honey, blackberries, and lemon. It’s smooth but tart enough to cut through the cheesy decadence of the pies.